1. Purpose: From Multi-Domain Battle to Multi-Domain Operations. 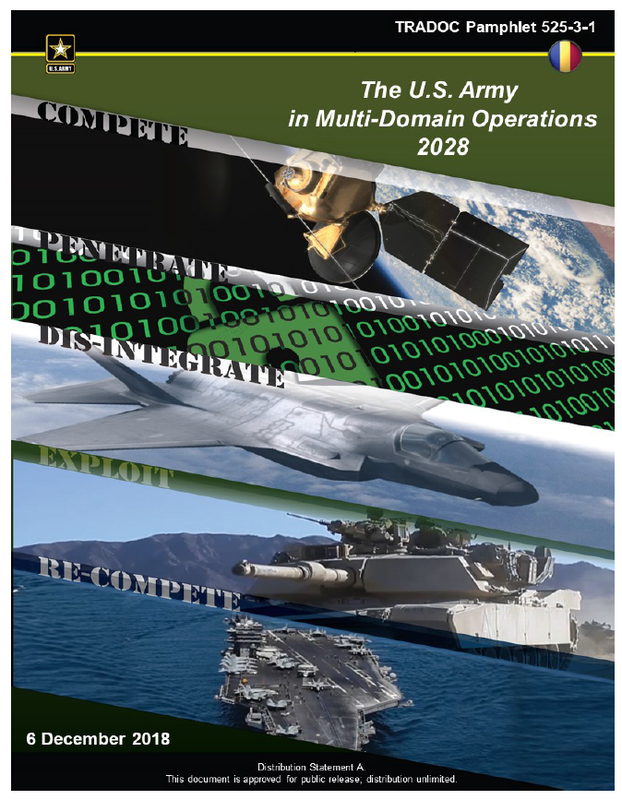 TRADOC Pamphlet 525-3-1, The U.S. Army in Multi-Domain Operations 2028 expands upon the ideas previously explained in Multi-Domain Battle: Evolution of Combined Arms for the 21st Century. It describes how the Army contributes to the Joint Force’s principal task as defined in the unclassified Summary of the National Defense Strategy: deter and defeat Chinese and Russian aggression in both competition and conflict. The U.S. Army in Multi-Domain Operations concept proposes detailed solutions to the specific problems posed by the militaries of post-industrial, information-based states like China and Russia. Although this concept focuses on China and Russia, the ideas also apply to other threats. a. Emerging operational environment. Four interrelated trends are shaping competition and conflict: adversaries are contesting all domains, the electromagnetic spectrum (EMS), and the information environment and U.S. dominance is not assured; smaller armies fight on an expanded battlefield that is increasingly lethal and hyperactive; nation-states have more difficulty in imposing their will within a politically, culturally, technologically, and strategically complex environment; and near-peer states more readily compete below armed conflict making deterrence more challenging. Dramatically increasing rates of urbanization and the strategic importance of cities also ensure that operations will take place within dense urban terrain. Adversaries, such as China and Russia, have leveraged these trends to expand the battlefield in time (a blurred distinction between peace and war), in domains (space and cyberspace), and in geography (now extended into the Strategic Support Area, including the homeland) to create tactical, operational, and strategic stand-off. For the purpose of this document, Russia serves as the pacing threat. In fact, Russia and China are different armies with distinct capabilities, but assessed to operate in a sufficiently similar manner to orient on their capabilities collectively. b. China and Russia in competition. In a state of continuous competition, China and Russia exploit the conditions of the operational environment to achieve their objectives without resorting to armed conflict by fracturing the U.S.’s alliances, partnerships, and resolve. They attempt to create stand-off through the integration of diplomatic and economic actions, unconventional and information warfare (social media, false narratives, cyber attacks), and the actual or threatened employment of conventional forces. By creating instability within countries and alliances, China and Russia create political separation that results in strategic ambiguity reducing the speed of friendly recognition, decision, and reaction. Through these competitive actions, China and Russia believe they can achieve objectives below the threshold of armed conflict. c. China and Russia in armed conflict. In armed conflict, China and Russia seek to achieve physical stand-off by employing layers of anti-access and area denial systems designed to rapidly inflict unacceptable losses on U.S. and partner military forces and achieve campaign objectives within days, faster than the U.S. can effectively respond. Over the last twenty-five years, China and Russia invested in and developed a systematic approach to “fracture” AirLand Battle by countering the Joint Force’s increasingly predictable use of time-phased and domain-federated operational approaches in armed conflict. The resulting anti-access and area denial systems create strategic and operational stand-off that separates the elements of the Joint Force in time, space, and function. Moreover, both China and Russia are continuing to improve these anti-access and area denial systems and are proliferating the associated technologies and techniques to other states. The Joint Force has not kept pace with these developments. It is still designed for operations in relatively uncontested environments that allow for sequential campaigns based on predictable approaches that assume air and naval supremacy: extensive shaping with air and naval strikes before the final destruction of severely degraded enemy forces through joint combined arms operations. a. Central idea. Army forces, as an element of the Joint Force, conduct Multi-Domain Operations to prevail in competition; when necessary, Army forces penetrate and dis-integrate enemy anti-access and area denial systems and exploit the resultant freedom of maneuver to achieve strategic objectives (win) and force a return to competition on favorable terms. b. Tenets of the Multi-Domain Operations. The Army solves the problems presented by Chinese and Russian operations in competition and conflict by applying three interrelated tenets: calibrated force posture, multi-domain formations, and convergence. Calibrated force posture is the combination of position and the ability to maneuver across strategic distances. Multi-domain formations possess the capacity, capability, and endurance necessary to operate across multiple domains in contested spaces against a near-peer adversary. Convergence is rapid and continuous integration of capabilities in all domains, the EMS, and information environment that optimizes effects to overmatch the enemy through cross-domain synergy and multiple forms of attack all enabled by mission command and disciplined initiative. The three tenets of the solution are mutually reinforcing and common to all Multi-Domain Operations, though how they are realized will vary by echelon and depend upon the specific operational situation. c. Multi-Domain Operations and strategic objectives. The Joint Force must defeat adversaries and achieve strategic objectives in competition, armed conflict, and in a return to competition. In competition, the Joint Force expands the competitive space through active engagement to counter coercion, unconventional warfare, and information warfare directed against partners. These actions simultaneously deter escalation, defeat attempts by adversaries to “win without fighting,” and set conditions for a rapid transition to armed conflict. In armed conflict, the Joint Force defeats aggression by optimizing effects from across multiple domains at decisive spaces to penetrate the enemy’s strategic and operational anti-access and area denial systems, dis-integrate the components of the enemy’s military system, and exploit freedom of maneuver necessary to achieve strategic and operational objectives that create conditions favorable to a political outcome. In the return to competition, the Joint Force consolidates gains and deters further conflict to allow the regeneration of forces and the re-establishment of a regional security order aligned with U.S. strategic objectives.